Group portrait of SS Minto crew, Captain Otto Estabrooks' retirement celebration, SS Minto, 1951. 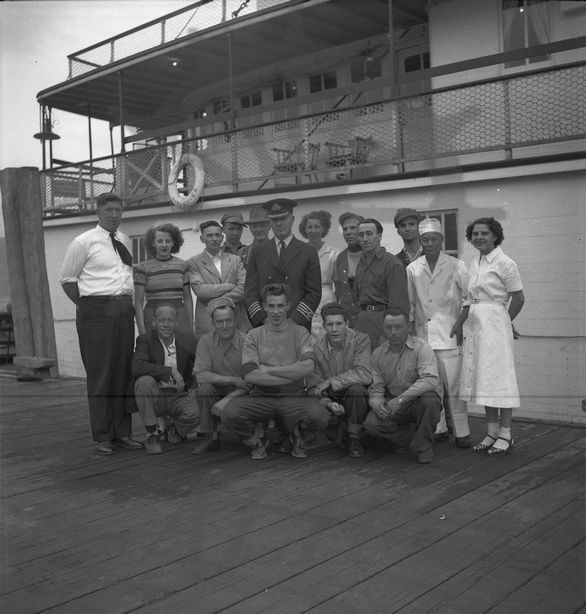 TOP (l-): Sam Podmoroff, mate; Margie Berg, waitress; Simon Ackerman, chief steward; Don Manning, fireman; Gordon Hempseed, night watchman; Otto Estabrooks, captain; Diana Manning, waitress; Ed Kiedyk, deckhand; Jimmy Allan, deckhand; Glen Twells; deckhand; Hoy Fat, chief cook; Toni Delorme, head waitress. BOT: Johnny Dyck, deckhand; Al Law, night watchman; Arnold Talbot, deckhand; Lloyd Mair, fireman; Andy Delorme, senior deckhand.